Beautiful plant! Can you get an image of the entire plant? Hey, Guess what!!!!! I'll see you in MIAMI!!!!!!!!!!! Looks like all of us are in that boat!! this schlectendallii. so it is a variable plant, and common in collections. A place for moms to take a break! Forgive me, I wrote this at 4:45AM and my brain is not quite awake. Where I stated "peduncle" below in red, I meant to say petiole. Could be Don. Dr. Croat indicates elongated berries are a possiblity in his journal on Mexican and Central American section Pachyneurium species. 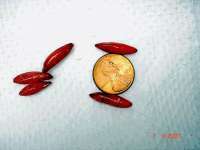 Red berries that are round tend to be more common, but the species is highy variable. However, in a personal visit with Dr. Croat at MOBOT last year he said a peduncle that was erect (not pendant) is more common for Anthurium schlechtendalii . Cut as a cross section, the peduncle could be Anthurium schlechtendalii, but it also could be Anthurium salviniae. The leaves on my large Anthurium schlechtendalii look nothing like this plant and Dr. Croat confirmed mine is A. schlechtendalii as well. Oh, how badly we need the Doc's guidance!!! rigidity to support the weight of the developing fruits. picked off the spadix when young and grown on. Do the berries have seeds in them? Many Pachyneuriums have berries this shape that are false berries and have no seeds. > Looks like all of us are in that boat!! MessageThanks Denis. I had considered A. cubens but the grower does not accept the possiblity. I'm unsure why. Yes, I have confirmed twice the berries have seeds, two per berry. The grower now has 30 new small plants grown from these seeds. Can't argue with logic. Dr. Croat did indicate when I was last in his office Anthurium schlechtendalii should have an erect peduncle with a pendant spathe. I may have to wait for him to return from Ecuador for a clarification, but the shape of the spadices in the grower's photos are not a close match to the photo he verified. 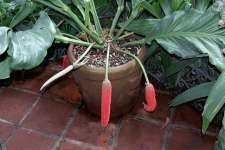 I'm attaching a photo of the spathe and spadix which he verified to be Anthurium schlechtendalii. In the case of this spathe, it fell pendant within days. It also developed a full head of berries and remained erect until the red berries were harvested and planted in pots. However, I understand the variableness of the species. Dr. Gon?alves informed me in an email last fall the peduncle should be longer than the spadix which is the case in both photos. I just checked the photos of the Mexican Anthurium again and the spadices don't match Dr. Gon?alves comment the spadices of Anthurium schlechtendalii should be longer than the peduncle. If you check the photos I'm attaching again the peduncle appears to be approximately of equal length to the spadix. I realize I may chasing my tail on this one. It may well be a hybrid or a variation, but I just can't make a significant number of details match to Dr. Croat's description. And I've read it about four or five times now. It doesn't match Anthurium cubense well either! And the seeds are viable. I think we need to buy the Doc a lap top with an internet link to a satellite! !